The year was 1985. I was in my 20’s, and my sense of wanderlust had already firmly taken hold, particularly when it came to exploring ancient civilizations. I’d had a blast traveling throughout Mexico and Central America, visiting and climbing (yes, you could do that back in the day) Mayan and Aztec pyramids and ruins. Fascinated with the Inca empire and archaeological sites, I excitedly took steps to plan a trip to Machu Pichu and Peru. Machu Picchu was my ultimate bucket list destination – before that term was even coined. In fact, it was even before Machu Picchu was a household name or its significance as a UNESCO World Heritage Site was much publicized. We were at Boston Logan airport, waiting to board. Time ticked on. Then without warning, before we could take our seat or take off , the U.S. government grounded our flight because the Shining Path guerrillas had bombed Lima, our preliminary destination. Oh! The pain! But life goes on, and I continued to travel the world, seeking out ancient cultures, empires, structures, and relics. Egyptians, Druids, Greek, Roman, and Siamese, just to name a few. But the Inca sites remained elusive, though my longing never ceased. Maybe it’s because the Inca ruins are shrouded in so much mystery and intrigue. Or perhaps admiration at having created such a grand culture without a written language, a monetary system, iron, or slaves. Often (mistakenly) referred to as “the Lost City of the Incas,” American historian Hiram Bingham is credited with discovering (more accurately exposing) Machu Picchu in 1911, although in truth there were already some families living in the area. Archaeologists estimate that Machu Picchu was constructed around 1450 for the Inca emperor Pachacuti. The exact purpose of the remote and sprawling bastion remains shrouded in mystery. One of the recent theories suggests that Machu Picchu was built to be a palatial retreat for Pachacuti, but was abandoned at the time of the Spanish invasion so that the conquerors would not find and ransack their cherished citadel. Another theory insists that due to the eight access routes into the city, it must have been an administrative and trading center between the Amazon and the Urubamba Valley and highlands. It is estimated that approximately 1200 people could have lived in the area. Whatever its purpose, Machu Picchu remained “lost” for almost 400 years. Nestled inside the Andes Mountains at 7,972 feet above sea level, there are a number of places to see spectacular views of the citadel and mountain range. Photos will be dependent on (1) weather cooperation and (2) number of people in the citadel. Naturally, you’ll want to capture that postcard-perfect, icon view. Surprisingly, that view is not very far from the entrance, although it’s around a nearly vertical 10-minute climb up large, uneven stone steps. From mid-morning until the end of the day, the crowds are fierce. There can also be quite a gathering waiting at the entrance for sunrise. Silver, our excellent local guide, brought us there about an hour or so after sunrise. The first crowd had filtered off to explore other areas, and the second wave hadn’t arrived yet. With just a small amount of patience and waiting, we were able to get stunning photos without anyone else in our frame! Who knew? Not surprisingly, there are dramatic and differing views all around the site. Machu Picchu was built in the classical Inca style. It took us around three hours to tour the entire site. One of the first sights that we saw was overlooking the individual structures. Quite suddenly, a mist rolled in, which to me just added to the mystique. There is a structure known as the Temple of the Sun where windows perfectly align with astronomical events such as the winter solstice. The royal tomb, adjacent to the Temple of the Sun, is a cave-like area enclosing ceremonial niches and an Inca cross carved from one wall. The Temple of the Condor is an exquisite example of Inca ingenuity. They took an ancient, natural rock formation and skillfully shaped it into outspread wings of a condor in flight. Do you see it? The Intihuatana is believed to have been designed as an astronomic clock or calendar by the Incas. Large rectangular stones, perfectly hand cut without the aid of iron tools, fit together so perfectly that no mortar was used. This technique has prevented the structures from being destroyed by earthquakes. Like other Inca villages, Machu Picchu also has a Sacred Rock. Before a village could be built, a sacred stone had to be dedicated to the site. The agricultural terracing and aqueducts take advantage of the natural slopes. In the high season, from late May until early September, up to 2,500 people per day can trample on the site. In order to preserve Machu Picchu for future generations, the government has imposed some new, stricter rules. First and foremost, you cannot enter the site without a guide so buying tickets in advance is a must. The number of people is limited and restricted to defined entry/exit times. Drones, tripods, umbrellas, or walking sticks are all prohibited. Elderly and physically handicapped who require sticks for mobility can bring them in but only with protective rubber tips over the ends. Selfie sticks are questionable, so I didn’t bring one. No large backpacks, food or drinks, or cigarettes. Peru is a relatively conservative country. Casual attire is generally fine, but high-exposure tops – for women and men – or short shorts are generally frowned upon, especially at religious sites. Plus, there are biting insects at Machu Picchu! In addition, the new regulations say it is prohibited to take off or change your attire, clothing or dress, get naked, lie down, run, jump on site. Wait, what? Yikes, I didn’t know, and took some clothes off…. Not to worry, I just took off my hoodie (not an issue), and slipped the traditional, hand-embroidered skirt I’d bought in Cusco right over my leggings (questionable). While Silver looked nervously around, none of the guards seemed to mind. I like how it looked in the photos, but in truth, if I’d known, I’d have put on the skirt before we got to the site. Do stay at an eco-friendly accommodation such as the gorgeous and luxurious Inkaterra Hotel in Aguas Calientes or the Mountain Lodges of Peru in the Sacred Valley. Do not touch the ruins as even the simple transfer of oils contained on human skin can erode the ancient stone structures. Do not venture into roped-off areas. This is unsafe. In 2016, a German tourist plummeted to his death while posing for a photograph in a restricted area. Do not support child labor. Giving money to young children hawking postcards or other tchotchkes just perpetuates the cycle of poverty. You’ve heard about the wild llamas at Machu Picchu, right? The llamas and alpacas have been there for a long time. They’re part of the camelid species and able to live in an environment with little water or foliage. They’re curious creatures….and adorable too! (Full disclosure: I’m not really touching the animal). Recent excavation by Frenchman Thierry Jamin in 2014 revealed a hidden door suggested as being the burial chamber of the famed Inca ruler Pachacuti. Subsequently, the Peruvian government sealed the door to prevent damage to the region, so future excavation seems unlikely. Machu Picchu is one of the most intriguing ruins on the planet. It was declared a Peruvian Historical Sanctuary in 1981 is and the best-known archaeological site on the continent. It was declared a UNESCO World Heritage Site in 1983 and voted one of the New Seven Wonders of the World in 2007. So I for one am in support of the new regulations which will hopefully help in the conservation efforts for one of the most amazing places that I’ve ever visited. One last thing…don’t forget that outside the entrance gates, there’s an easy-to-miss table where you can get the novelty Machu Picchu stamp in your passport! Want more Baby Boomer inspiration? 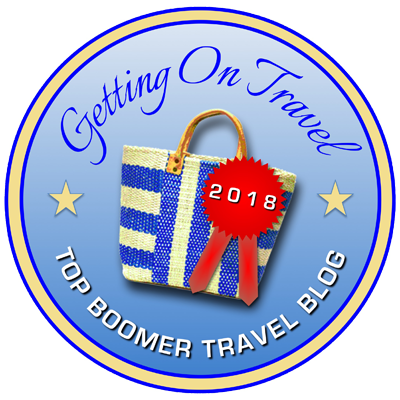 Check out these Baby Boomer Travel Trends! Here’s a guide to the best time to visit Machu Picchu. If you’re considering an extended stay in South America, here are some backpacking South America itineraries up to 6 months. Disclosure: The author was honored to be the guest of AdventureSmith Explorations during her stay in Peru, but as always, the opinions, reviews, and experiences are her own. Tagged Machu Picchu, Machu Picchu regulations, Peru. Machu Picchu is so high on my bucket list its off the list! Hard to believe people built something this beautiful so many years ago. Wow Patti, what a fact-filled article this is. We are planning a trip to South America including Belize, Machu Picchu and Patagonia in 2019, I’ve bookmarked this article for my research. Found it on Getting On Travel. Once again thanks so much for such an informative piece. Thanks, Chris! So glad you found it helpful — that’s my goal. Have a fantastic trip! Pingback: 10 Disappearing Tourist Sites: To Go Now, or Never? You are having a great time, Machu Picchu sounds a nice place to visit as I have heard about it very much. Thanks for sharing this post. An excellent read and photos. Thanks for sharing! I found a used copy of the novel The Incas by Daniel Peters, almost 1100 pages, published in 1991. It was absolutely spell-binding; I couldn’t put it down. Ironically, I found the book in a tiny English-language used book store in San Telmo, Buenos Aires. If you are a reader and have been to Machu Picchu, you would love this novel. I believe it is well researched. I’m glad that the powers that be are paying attention to limiting the effects of over-tourism on Machu-picchu. Someday I want to go there! Thanks for the recall of all my Machu Picchu memories. It’s a magical place and I want to go back. Machu Picchu is one of those places I’ve always thought I wouldn’t go to because of the crowds. But you managed to get some lovely uncluttered pictures! I think it’s good that they are going to ration entrance – makes it better for everyone (and for the site) in the long run. I loved hearing all about the history – Machu Picchu is such an icon it was great to hear some of the background! Sounds like a fabulous trip. Your pictures truly tell the story and breadth of the mountains. Definitely adding Machu Picchu to my travel bucket list. Loved this post. Machu Picchu certainly looks impressive and dramatic. I don’t know if I will ever get to Machu Picchu myself, but I appreciate the regulations helping with conservation efforts. Loved reading this, Patti. Hope I get there some day. Wonderful post, Patti! We’d tried to get to Machu Picchu several years ago the we were in Peru, but the roads got washed away due to heavy rains and a mudslide and we had to change our plans. I’m glad you finally got there and enjoyed the journey.